Generate 'One String' using Product Id, Install Date & Username. Digsby is is one of the popular instant messenger of recent times with IM client, Email Notification & Social Networking all in one software. 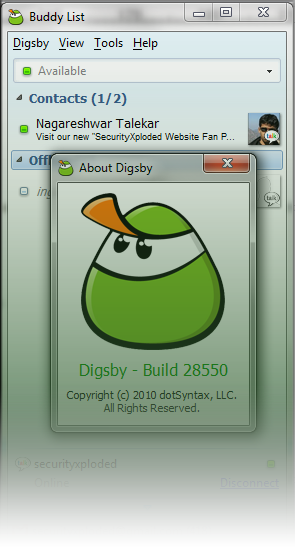 Digsby has a multi protocol IM client that lets you chat with all your friends on AIM, MSN, Yahoo, ICQ, Google Talk, and Jabber with one buddy list.It has an email notification tool that alerts you of new email and lets you perform quick actions. Its social networking feature lets you manage all your feeds from popular social networking sites such as Twitter, Facebook etc at one place while you are chatting with your friends. Like most instant messengers, Digsby also stores the user account details including passwords in the local repository for subsequent logins so that user do not have to enter the password every time. Note that the password is stored only if user has selected 'Save Password' at login time. Here is the typical format (taken from logininfo.yaml) in which account name & encrypted password is stored for each stored user account. Here the "username:" & "password:" for each account is listed and they can appear in any sequence. Also 'save:' field indicates if the password for this account is stored or not. Digsby encrypts the password for better security and encodes it with BASE64 before storing it into above file. Note that Digsby stores only main IM account password locally and all other IM account passwords (such as Yahoo, Gmail, AIM) are stored on the server. As mentioned above, Digsby uses special algorithm to encrypt the main account password which is stored in BASE64 format in the password file. Once you retrieve the encoded password, decode it using BASE64 algorithm. Resulting text is nothing but encrypted password with the same length as original plain text password. So merely decoding the password, you will come to know about the length of password. It uses Product ID, OS Install Date & Digsby Username combination to generate unique hash which is later used in encryption of the password. Though this encryption appears to be specific to system, one can easily use current system's product id & install date and perform offline password recovery on different system. This is especially useful and typical case with forensic scenarios. Here are the detailed steps for decrypting the encrypted Digsby account password. As mentioned earlier, Digsby stores the account password in 'logininfo.yaml' file. You need to retrieve the Digsby username & associated password from this file. Then use the BASE64 algorithm to decode it and get the encrypted password. Username & associated password per account start with unique identifier "username:" & "password:" respectively. DigitalProductId is a binary array where as InstallDate is a integer. You need to convert the InstallDate to string format before using it. Caution: On 64 bit systems, the above key is present in the 64 bit hive only. Hence you need to use flag KEY_WOW64_64KEY for 'Desired Access' to correctly read above registry values. I was scratching my head for half a day to figure out why my simple registry function is not able to read it. 3. Generate 'One String' using Product Id, Install Date & Username. Now simply combine Product ID, Install Date & Digsby username in that order to form one complete string. Next compute SHA1 hash for the above generated string. Here is the complete code example to create SHA1 hash using Windows Cryptography Functions. On successful completion, we get the SHA1 hash which is of 20 bytes. This hash is used as the key for decryption of main Digsby password. Here we will use the previously generated SHA1 hash to decrypt the encrypted password. The below code generates new hash of size 256 bytes from the SHA1 hash. Finally it uses newly generated hash ('newHashData') to successfully decrypt the earlier decoded password ('byteDecPassword') from the file in Step 1. In each stage of the loop, each encrypted character from decoded password is decrypted and put back into the same location. At the end, variable byteDecPassword will contain the final decrypted Digsby password. Now here is the interesting thing, Guess the name for above algorithm and get your name printed here ! DigsbyPasswordDecryptor is a dedicated tool to recover account passwords stored by Digsby. It can automatically detect the correct secret password file based on installed version of Digsby and then decrypt all the stored account passwords on the fly. 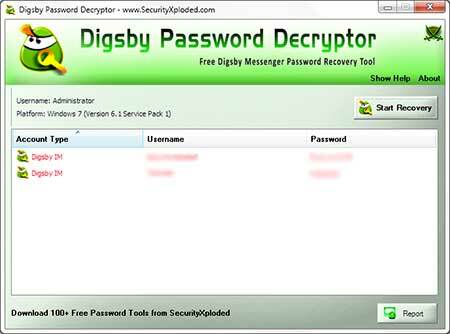 DigsbyPasswordDecryptor is a portable tool which does not require installation and work across wide range of platforms starting from Windows XP to Windows 7. You can also use our other tool, IMPasswordDecryptor to recover the Digsby passwords along with other instant messenger passwords. Above article explains in detail how Digsby stores the account password using its own proprietary encryption algorithm and shows how one can manually decrypt such password to recover the original password. Note that above decryption process is based on latest version of Digsby Messenger (Build 83 - r28550) and it may change with upcoming versions of the Messenger.